Electrostatic technology has been around for a long time and is now common in the cleaning industry. It has helped improve cleaning methods for janitorial personnel. Hard to reach surfaces are made easier to clean with the capability of an electrostatic sprayer. Low and underneath surfaces can be cleaned and disinfected with less kneeling or bending. Traditional sprayers improperly transfer too much or too little cleaning solution onto surfaces. This issue is eliminated with electrostatic sprayers. Now that manufacturers have access to electrostatic devices, it replaces bulky and/or multiple part machinery with one that is compact and easy to use. The convenience of an electrostatic sprayer makes difficult areas less time consuming to clean. 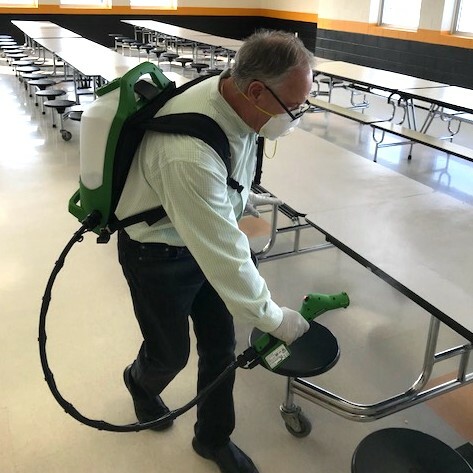 Disinfecting germs is a common use for this technology and can be applied to a greater surface area more quickly. An electrostatic charge to a chemical is applied to and generates and even coating when applied to a surface. All of the particles within the liquid are positively charged, then repelled from one another, creating an atomized spray. This creates a leveled coating for hard to reach areas. An electrostatic sprayer improves the usage of applying chemicals in a more controlled and effective method. It reduces the risk of overusing or improperly applying chemicals. Multi-task dilution control system is a Multi-clean development that assists in dilution control through eliminating waste from free pouring by dispensing a more accurate chemical concentration. Multi-clean offers a variety of cleaners and disinfectants available through the Multi-Task dispenser that are well-suited for use through an electrostatic sprayer. For more information, visit our Electrostatic page.